In medium bowl, mix mayonnaise and egg with wire whisk. Stir in remaining ingredients except plain bread crumbs and oil. Shape mixture into 6 patties, about 3 inches in diameter (mixture will be moist). Coat each patty with plain bread crumbs. In 12-inch nonstick skillet, heat oil over medium heat. Cook patties in oil about 10 minutes, gently turning once, until golden brown and hot in center. Reduce heat if crab cakes become brown too quickly. To make salmon cakes in lieu of crab cakes, substitute 1 (15-oz.) can red salmon, drained, for the lump crabmeat. Cooked shellfish should be moist and slightly chewy; overcooking makes it tough and rubbery. When cooked correctly, crab should turn bright red. What a classic--golden brown outside, moist and full of crabmeat inside! 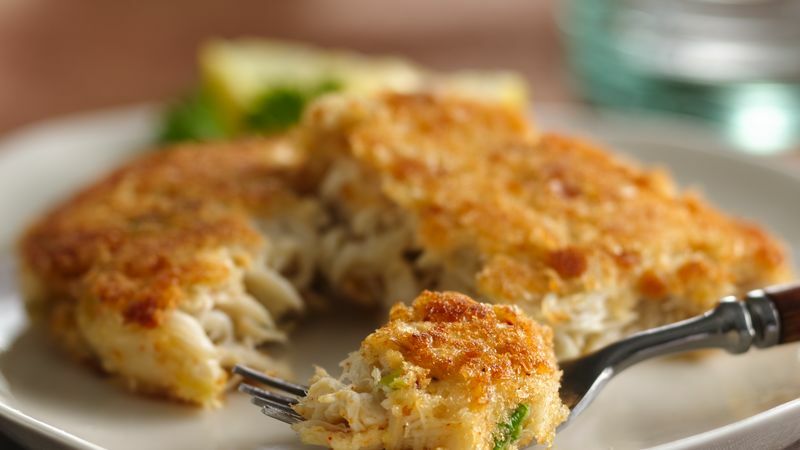 Crab cakes are also wonderful served as a main course--allow two per person.